Jean Carles, the Beethoven of modern perfumery, created many unforgettable classics that have changed the world of perfumery forever. Tabu and Canoe (Dana), Shocking (Schiparelli) as well as several scents for Lucien Lelong. And like Beethoven, he lost his sense of smell towards the end of his career. But that did not stop him from creating great fragrances. Ma Griffe being one of them. And like Tabu and Schiaparelli, whatever it lacks in nuance and refinement, it makes up for in a bold and innovative advertising campaign. 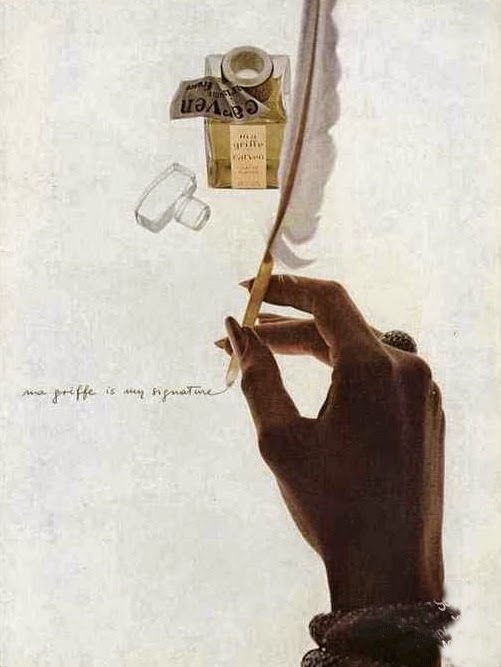 I've always had a fondness to Ma Griffe (1946), be it the original (and more demure ad) portraying the literal meaning of the scent "My Signature" with a lady's hand signing her name with perfume instead of ink. But also always ignored it because of my much greater love and loyalty to Miss Dior, the epitome of animalic-floral chypres tinged with green. When smelled separately, the two bring each other to mind. But Ma Griffe has a certain crudeness to it that has softened and rounder by the time 1947 rolled around with Miss Dior (also created by Jean Carles, this time in collaboration with Paul Vacher. The extrait for Miss Dior, by the way, was reworked by Edmond Roudnitska). By then he must have perfected the concept, resulting in a seamless Chypre that is like no other. Ma Griffe opens with a burst of juicy lemony notes and bergamot, as well as citronella, which I feel is the culprit of the opening notes, and probably what made it not nearly as popular as Miss Dior that followed it - the citronella gives a sharp impression that takes away from the refinement of the rest of the composition. There is a hint of galbanum, but not enough to leave trails on your man's back! As the perfume evolves, it becomes more bitter, tart and woody, and less feminine and sultry. Aside from galbanum, two other contributors to the bitterness is methyl ionone and coumarin - notes that bring to mind the metallic-floral prowl of Je Reviens and Rive Gauche. This phase, admittedly, is not my favourite part of Ma Griffe, which also has a hint of oily aldehydes (C-11, C-13) - giving it a very lady-like personality. It's charming in low doses, but is very particular to the era and not necessarily appeal to today's fast-paced, simplicity-seeking lifestyle. I imagine the same "type" of women who enjoyed it in the 50's would now appreciate the reformulated Sisley's Eau de Champagne - which is a lot more simpler, brisk and still has that bitter charm of a glass of very dry martini. Once the aldehydes quiet down a bit, the warmth of cinnamon begins to come through, as well as a hint of incense from the styrax (AKA liquidambar - one of the main components for creating amber accords). The florals are not particularly strong in any phase, but if anything comes through, it's the spiciness (hint of eugenol) and fruity-banana-like nuance from the ylang ylang. This underappreciated floral is a wonderful, smoothing counterpart to green notes, who in return cif ut through its intense, heady sweetness. Both together eliminate their potential for nauseating headiness, and create something new and exciting. If you've smelled Chamade, with its prominent galbanum-ylang ylang contrast, you may know what I am referring to. As Ma Griffe dries down, it's becoming even more appealing, especially for the connoisseurs of unsweet perfumes. Strong presence of vetiverol - the vetiver alcohol - gives it a very clean, tart, precioius-wood finish that men could sport with just as much confidence as ladies. This review is for a pre-IFRA regulated version (from days of yore, when there was no requirements of listing any allergens on the ingredients list) and in the EDT formulation. It's very vintage-y, and if comparing to Miss Dior - it has more of a white floral and musky nuances to it, which remind me a bit of Chant d'Aromes. It also has more of a citrusy burst and it's more aldehydic and powdery than Miss Dior. I should get around to write a full review of it next week. One of these days I'll do a side-by-side of these three beauties, and give you a more elaborate comparison. It's odd that you should mention Ma Griffe in connection with Chant d'Aromes because I've always guessed that C d A was the Guerlain "version" of Ma Griffe, put through the Guerlain finishing school you know? Anyway I'd love to see a side by side comparison of some of these since I no longer have any Miss Dior.